I'm changing my benefits provider during the year and need to update my W-4 form and, for California, my DE 4. I'm changing my filing status from Single to Head of Household, so I've been having too much withheld during the first half of the year and would like to reduce the amount for the second half. So, you fill in either a number of allowances, or a dollar amount representing the total amount to be withheld per pay period - do I understand this correctly? there is a total number of allowances (line 5) and an 'additional amount' line 6. Can I fill out just line 6 instead of line 5, and have that be the amount withheld from each paycheck? No, you need to specify a number of allowances, and the additional amount. Line 6 is extra beyond what the amount from the allowances is. For what it's worth, the IRS has realized this, particularly with reference to the new tax structure; the 2019 draft W-4 does not have "allowances" and has a much more detailed set of options. They still don't simply say "how much to withhold", in large part because it's in their interest to withhold more, and they want to make sure that if you get a raise or bonus or whatever that you don't under-withhold from that. Not the answer you're looking for? 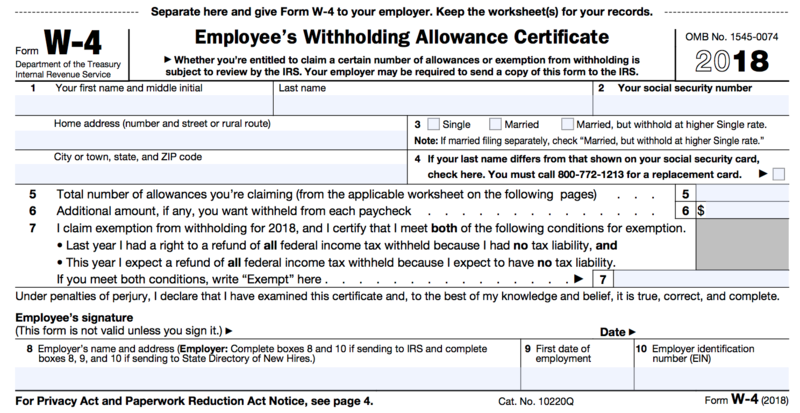 Browse other questions tagged united-states withholding form-w-4 or ask your own question. How to fill Form 8889 (HSA) Part III?